A-Pro Annulus Pressure Management System > PTC - Well head, Gaslift, and Chemical injection for improved well performance and integrity. Lack of infrastructure at well sites (power, communication and/or control systems) prevents the continuous and efficient monitoring and control of annulus pressure. Manual surveillance and potential venting of annulus pressure adds cost and involves HSE risks. Furthermore reading gauges manually introduces the risk of human error. 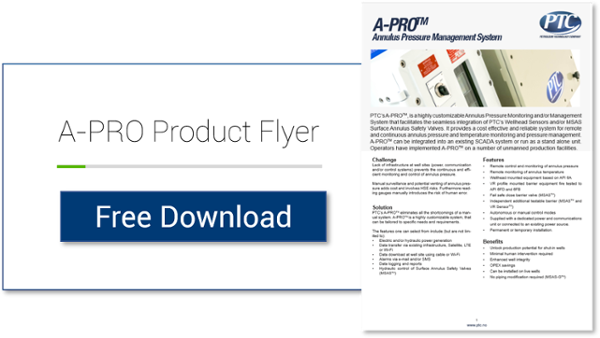 PTC’s A-PROTM eliminates all the shortcomings of a manual system. A-PROTM is a highly customizable system, that can be tailored to specific needs and requirements.